VolvoGuard Alarm I System: Siren & backup Battery location? 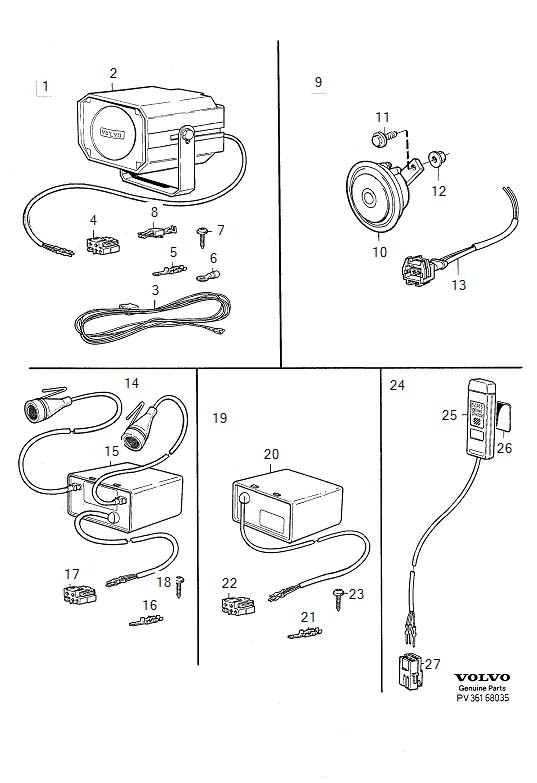 My 1994 440 Volvo´s alarm system battery died, I need to replace it, but where is its location? The siren is mounted low down on the bulkhead in the engine compartment, known as the firewall in the US. It is on the passenger side on a left hand drive car. I haven't heard that there is a backup battery in the alarm system and can't find any mention of one in the manuals that I have. What is the problem with the alarm? I'll try to see if the siren is there, I'm crossing my fingers. About the support battery, yes there is one in my opinion. When I bought my car it still carried the original battery, some time after it stopped holding charge enough to start the car, so I replaced it with a new one. However during that operation the siren and the hazard lights went off!! Only shutting up once the brand new one was connected. That's why I assume the alarm system has its own battery, how else would it work without any battery connected? Early this year the car's battery had to be replaced again. At first I had no clue about what was going on, the alarm would start sounding and the hazard lights flashing without any apparent reason. Until one fine day the alarm system went off again but by the time I got near enough to use the remote fob, the hazard lights stopped flashing and the siren sound was faded to a very low chirp and shut up by itself. The car had no power, the battery was dead and after days charging it held no charge. A new battery was installed, the alarm was fine again. Now, some months passed by and my issue is that this same battery (which is short from 1 year old) is not holding charge enough to start the car every 2 to 3 weeks, I need to charge it that often. I know it doesn't drain completely because the radio keeps the code, the clock slows however. I also took the battery to the warehouse I bought it from, they kept it for 3 weeks and returned it to me fully charged and with no faults detected and advised me to see if any lights where on even with all doors locked. Checked it, even took off the trunk and the glove box bulbs out to no avail. So I guess the alarm battery is the one to blame. It must be dead thus not charging and the alarm system is feeding from the main battery. "Been having problems with the poor range of my remote central locking. The LED light on the dash was flashing a fault warning and I have to be right next to the car before the remote fob will unlock/lock the car. I've changed the batteries in the fobs twice with no improvement. I bit the bullet and took it to my local dealers who plugged it in and discovered the battery was flat in my siren module but no other faults were evident. The dealer told me the battery couldn't be replaced and a new siren would cost around £120+VAT! I phoned Simon at FRF Volvo in Swansea who did a bit of digging and found that actually an alarm siren battery module can be bought for about £45. I bought one and fitted it. To be perfectly honest the most difficult part was actually locating the siren which on my car was under the plastic splashguard on the offside wing just behind the indicator. Next was drilling out the 5 pop rivets which hold the splashguard in place to allow access to the siren. Replacing the battery itself involved undoing two bolts and 4 screws to get inside the module and took approximately two minutes. The LED has stopped flashing and the siren works. Unfortunately the remote control range hasn't improved so I think I need a new receiver module. The NiCad back-up batteries in the siren have a reported average life of around 8 years." Lets see where these clues will help solve my issue. Alas! I found it! Its part nº 3542743. It's hidden under a plastic protection and about 7 centimeters off the left side windshield washer arm. My suspects were correct, it mentions it's chargeable.